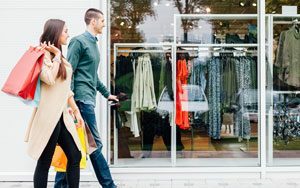 Retail sales are expected to grow 3.4% in 2017. 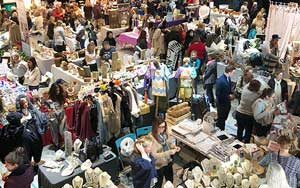 Many sellers and shoppers alike are optimistic that 2017 will breathe change and new life into our industry. As a nation, we are looking at new economic plans under a new president and many states have voted to implement new minimum wages, meaning more consumers will have more spending flexibility in the coming year. This past year, we have seen major trends towards health-conscious themes and preferences towards natural and made in the U.S.A. products. 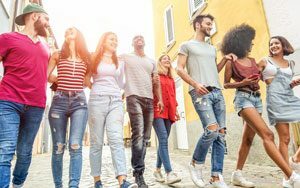 As always, consumers are looking for simple and novel solutions to improve their day-to-day quality of life, as well as fun tech toys and innovations. To help you plan for the changes ahead and stay up to date on the latest movements, Independent Retailer has gathered our favorite new, trending, and top selling products that can be easily added to almost any store’s inventory to launch you into a successful and profitable 2017. The patented mom-created LayNGo design is built to provide “portable, simple solutions,” says founder Amy Fazackerley. The original product was made as a solution for her kids’ toys and Legos®. “I got really frustrated with not being able to manage their Legos®. There are lots of bins and buckets, but nothing that allows you to see all the pieces that you want to play with. And no solution where you don’t have to pick up 8,000 Legos® daily,” explains Fazackerley. So she created something that was portable, washable, and practical. The LayNGo can lay flat to spread out all the toys, and has a raised edge to keep toys from spilling out. When not in use, the bag cinches closed with a drawstring for easy transporting or storage. Once the initial and travel-sized models were successful, Fazackerley realized there are other applications for her product. “I have the same problems with my makeup bag,” she explains. “Bags are black holes, you can’t find what you’re looking for. Cosmetic bags also get really gross and you can’t clean them.” The cosmetic LayNGo is extremely portable, has elastic straps for brushes and tubes and a zippered compartment for jewelry and smaller cosmetics. It is also completely machine washable and available in three different sizes. With all of the LayNGo products, “We use high quality so that everything can be washed many times. Standard wash tests are one to three washes. We perform ten to twenty wash tests,” says Fazackerley. In addition to the Lego® and cosmetic lines, LayNGo has a tech bag, a men’s travel bag, and is currently developing a travel pet bed with car straps for traveling, and that can be used as a bag for carrying other pet essentials. Fazackerley provides her retailers with lots of merchandising and marketing tools. “We have counter displays, samples to put out so customers can see for themselves, we give a really high level of customer support, and we have lots of information to educate buyers,” explains Fazackerley. The order minimum is usually $150, which is the cost of a counter display, and they have keystone pricing. EcoSmart is committed to sustainable environmental processes and providing quality services and products to retailers. Their newest line, the Blueprint Project, is a collection of customizable charm bracelets and necklaces that are made in the USA with EcoSmart’s patented SafePewterTM metal. Their entire process is handcrafted and waste-free, and they use recycled water and metal. In addition to a sustainable economic footprint, the Blueprint Project leaves a small counter footprint. Its display packs a profitable punch in a small, engaging showcase. The display holds necklace chains with three different lengths, bracelets with a matte and shiny finish and hundreds of charms. The charms are uniquely designed by EcoSmart and portray animals, initials, astrological signs, nature, inspirational words, hearts, coffee beans, butterflies, peace signs, keys, evil eyes, and more. Each fastens with a lobster claw, and the handmade charms have a wholesale price of just eighty-five cents and suggested retail is upwards of several dollars, offering retailers excellent margins. 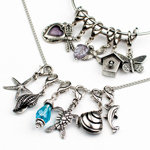 Retailers can purchase complete assortments of charms, or themed assortments. The Blueprint Project was created to allow retailers to keep up with providing the latest in fashion jewelry trends while promoting repeat business, so EcoSmart is constantly coming out with new designs. Customers can create their own one-of-a-kind pieces and keep coming back for more. The StubbyStrip, a first-of-its-kind invention, was created by a pioneering Aussie named Brett Gresham after watching a group of friends arrive for a barbecue. When some friends arrived clutching their warm beers in a range of random ways, it got him thinking that there had to be a better way to carry beer and keep it cold. StubbyStrip is made with a wetsuit material called neoprene that helps keep bottles cold. The design holds up to seven bottles, includes a removable drink holder, and its size is completely adjustable to the amount of bottles you want to carry. Available now, Stubbystrip offers a customizable premium model with a shoulder strap, and a model that holds larger wine and liquor bottles, or allows the creation of a portable bar. The StubbyStrip is a party favorite and a conversation starter. This product is a great addition to party, gift, outdoor, and convenience retailers. “Girls can love trucks. Boys can love pink. We all can love the same things. There are no rules. Just wear what you love™.” Founded by a mom of twin girls who loved trucks, Pink Truck® is the Twinspiration™ brand that’s been featured in Women’s Health, the Boston Globe, NPR®, and several news shows across the nation. Even before their first birthday, Dana Babbin’s twin baby girls fell in love with bulldozers and snowplows. They loved fire trucks and construction sites and had little interest in dolls or stereotypical girly things. When Babbin went searching for clothing that reflected her children’s’ interests, she had to shop from the boys’ department. She wanted her girls to have more options, so she created Pink Truck®, a clothing line for all ages. Pink Truck®’s tees, hoodies, and hats offer adults and children a chance to wear comfortable, stylish and trend-setting apparel that also sends a strong social message: be who you are; wear what you love™. “Pink Trucker’s,” or the community of men, women, and children who wear Pink Truck clothing, are in support of a new era for people who love pink, love the designs, or just love the message. At almost two years old, this distinctive brand offers ten designs in a variety of casual wear, all unmistakably recognizable as a Pink Truck® design. Pawdpet is another mom-invented product that fulfills a need presented by her two girls. Pawdpet is a plush character that keeps cellphones and tablets safe and secure while kids are using them. The characters have magnetic bellies that are completely safe for electronics, and keep the device snug to the plush animal. The characters can sit hands-free upright or on their side for playing games and watching videos. Pawdpet comes in two sizes and four different animal designs. Each Pawdpet has a plush pocket on the back for device storage, and an adjustable, detachable cross-body strap for carrying. Soapsox is a playful invention that allows kids to bring their favorite stuffed toy along to bath time. The soft plush toy has a patented interior of mesh and antimicrobial sponge to turn the toy into a super foaming, hygienic, bath tool. Each animal has a patented SoapSox pocket for a mouth, for inserting, or “eating” the bar or liquid soap. Each animal also has finger-sized pockets on the side for easier gripping, squeezing, and washing. Once bath time is over, SoapSox is machine washable and tumble dry safe. They can also be hung out to drip-dry using an attachable cord. SoapSox successfully appeared on Shark Tank, and are carried by some national retailers such as Bed Bath & Beyond®, Target®, and Nordstrom®. However, the company website advocates shopping small and supporting local retailers and lists all retail stores on their website. Recently, SoapSox has partnered with Disney® to create licensed character bath buddies including The Little Mermaid®, Finding Nemo®, Minnie®, and Mickey® characters. Recently featured on Good Morning America’s Deals and Steals, Promier Products’ cordless LED light switch is consistently selling out in stores across the nation. The handy light is battery operated and easy to install with included hook and loop fasteners, built-in magnets, or the picture hanger hole. No electricity or wires required. At 4.5” x 3” x 1.5”, it is the perfect size for cabinets, closets, and workstations. However, the light releases 200 lumens, so it is powerful enough to light an entire room. In addition to the traditional model, the cordless light is available in a jumbo 400-lumen model, 2-pack, and a 200 pivoting switch model. High-quality technology that offers a simple solution is a no-brainer. Wraps wearable headphones provide a tangle-free storage solution, clear sounds, and a unique look. The headphones come in an assortment of colors and a braided fabric cable. When not in use, the headphones wrap around your wrist. The ends can be secured in two different adjustable ways, meaning they can fit any wrist. Wraps are a utilitarian product that also happens to be pleasing to the eye. They provide a practical solution to people who like to have their headphones readily available or hate having to untangle them from inside a bag. They make perfect sense for commuters, students, avid music and audiobook listeners, and anyone who wants to carry their headphones with them hands-free and bag-free. The headphones have been featured in Forbes, Inc. ®, and MSNBC®. Chewbeads are soft, non-toxic necklaces and bracelets that are stylish enough for mom to wear, and safe for kids to chew. As all moms know, most babies love to put anything and everything in their mouths. Mom’s jewelry is an easy and eye-catching thing for teething kids to reach for, yet not always safe. Chewbeads are 100% silicone colorful beaded jewelry with no BPA, lead, or metal. They are also completely dishwasher safe. The stylish solution has appeared in many parenting and women’s magazines, in addition to being endorsed by famous mothers such as Martha Stewart and Jessica Alba. Have you ever wanted to take a hands-free selfie, without a bulky selfie-stick? Or what about being able to keep your phone at eye level while cooking from a recipe? Wannie Park, one of the founders of Mega Tiny, knows the feeling. “I’m married with three young boys, we take a ton of photos as a family, but one parent was always missing from the picture because one of us was always taking the picture,” explains Park. “We refuse to use a selfie stick, so the inspiration was, there must be a way for us to stick our smartphone onto a flat surface so we could all be in the picture.” The anti-gravity phone case has nano-suction technology enabling the phone to securely stick to any smooth flat surface such as glass, mirror, whiteboards, metal, cabinets, tile, and more without any damage or residue. Buggyguard is another mom-invented product, created to solve a common parenting need. “Strollers are big investments,” explains Buggyguard creator and Buggygear company founder Annette Atteridge. When you visit a park or playground you want to be able to have your full attention on your children, not worrying about someone stealing your stroller. Buggyguard is a lock with a cute, unassuming appearance of a monkey or pig that can be fastened right onto the stroller with its Velcro strap when not in use, so you never leave home without it. When in use, the stainless steel cable can extend to almost four feet long, so the cord can be looped through one or several stroller wheels. This tiny cell phone fan is a fun impulse item that would make a novel addition to any store. The fans are available in many assorted colors and both iPhone and Android options. They are convenient for cooling off in hot weather, and for getting the perfect windswept look in your selfies. The fans plug right into the charging port of the phone and use very little battery. Quality leather wallets never go out of style. Men and many women use these classic staples every single day. Soft and strong leather with sturdy stitching means these wallets are built to last and built to form to your pocket. So, how can the classic leather wallet ever be improved? By adding a built-in phone charger. The leather Nomad charging wallet comes in a slim and bifold design and is made of 100% American leather. The incredibly compact 2400mAh battery is built into the spine of the wallet, meaning is it no larger than a standard wallet, and provides a full charge for iPhones. Sugru is a truly one of a kind product. It’s the first “moldable glue that sticks to almost anything and turns into a strong flexible rubber overnight,” explains Sugru PR manager Clare Dixon. “Invented for people looking to repair and improve stuff, it’s used by people in over 160 countries – from homeowners planning DIY projects through to people making small improvements to gadgets, appliances, and even toys. Created by a young product designer, Sugru is made to stick to as many materials as possible forming a strong bond to aluminum, steel, ceramics, glass, wood and other materials including some plastics and rubbers,” continues Dixon. Sugru sticks permanently to many surfaces. Once you start molding the substance, you have thirty minutes to finish fixing, creating, constructing, etc. Then in twenty-four hours the Sugru turns into a durable, flexible silicone rubber that stays stuck. People have used Sugru to patch shoes, build wall hooks, create labels, fix fridge shelves, add grip to clothes hangers, reinforce charging cables, heatproof mugs, and more. 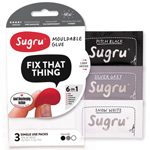 Sugru is sold in packs of three or eight and is currently sold in over 1,000 independent retail stores nationwide. For wholesale information, contact sales@sugru.com. Psi Bands work by applying consistent pressure on the Nei-Kuan acupressure point, located between two tendons in your wrist. Acupressure has roots in traditional Chinese medicine. This particular point is supported by several clinical studies for preventing and treating nausea. The bands provide relief from symptoms without any drugs, side effects, or interfering with day-to-day activities. In addition to winning several awards and accolades, Psi bands have appeared on Shark Tank, Good Morning America, Women’s Health, O Magazine, and many other media outlets. POP displays are available. Each display holds six units. Each unit contains two Psi Bands – one for each wrist. The wholesale cost is $9.99 per pack of two bands. Orders of 96 or more packs receive a discounted rate of $8.84 per set. The suggested retail rate is $14.99. 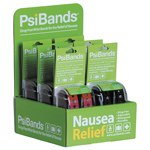 Psi Bands does not sell direct to consumer, so all of their advertising and press directs to their wholesale buyers. Toggles are adjustable, versatile accessories for your wrist, ankle or hair. They’re available in a wide variety of colors and styles. Perfect for stashing in your gym bag or traveling, and are more stylish on your wrist than a plain hair tie. Select from a wide assortment of colors and styles such as animals, sports, friendship, and more. Like all Whitney Howard Design products, Toggles are made in the U.S.A. and handcrafted with recycled, lead-free pewter. Whitney Howard Designs is committed to crafting accessories that are affordable and relatable. Toggles are a fresh take on a familiar idea. The simple and customizable design is appealing to men, women, and children alike. Hypnocube is a LED circuit lamp designed by Chris Lomont, who specialized in quantum computing and computer security, and co-founded with Gene Foulk. The lamp has many smaller LED bulbs that create colorful patterns and is consistently changing. Lomont describes it as a “LED lava lamp.” The color sequences never repeat, and there are 4096 possible colors uniquely displayed by each LED. The lights are available fully assembled, hand-assembled by the creators with a USB option that make the device “hackable,” and kits that require complete assembling. There is also a slightly smaller, framed version called Hypnosquare. This lamp is extremely unique, complex, and appealing to many consumers whether they appreciate it for the complex coding or the soothing aesthetic. For wholesale information, contact sales@hypnocube.com. Stwrap is a patent-pending bag strap accessory that lets customers show off their team spirit, personal style, and important causes in a fun and fashionable way. Stwraps come in a variety of licensed sport team designs, animal designs, emojis, flags, destinations, zodiacs, and more. Retailers can also design custom stwraps with any high-resolution image, perfect for souvenirs and mementos. Stwrap can be used on any bag with straps that are between 1” – 1.5” inches wide. Inventor Tom Augustine created Stwrap when he realized that most pins and bag accessories are meant for the main compartment of the bag. Augustine wanted something that was more visible and could be placed directly on the strap to show support for your favorite sports teams, animals, etc. Stwraps are small, unique items that make for fun impulse buys by the checkout area. B.dazzle is a producer of Scramble Squares®, a challenging educational puzzle for children and adults of all ages. Similar to a Rubik’s Cube, the puzzles are all made up of nine square tiles. At first glance, the puzzle seems easy due to the large square pieces. However, in practice, it’s very difficult to solve. The graphics on b.dazzle’s puzzles are repetitive images, which are what makes solving the puzzle so difficult. Scrambled Squares® are available in licensed sports patterns, animals, nature, hobbies, cultural, geography, science, technology, and other patterns. President and CEO Kathleen Gavin recommends retailers have a demonstration puzzle out for display. Customers and children alike are drawn to solving the image. They make great coffee table decorations and conversation starters. For wholesale information, contact info@b-dazzle.com. Stain imaging is not so much a product, as an alternative printing and design opportunity. Stain imaging has a specialized alternative technique for allover decoration on cotton fabrics. The monochromatic method is an alternative to belt screen printing, jumbo screen print, direct to garment, full body sublimation, and even cut and sew methods. It’s an eco-friendly option that gives retailers a whole new way of thinking of cotton and jersey knit product enhancement. The innovative allover imaging is completely customizable and creates an edgier look. The process is extremely versatile and allows for additional traditional screen-printing on top of the stain imaging, for an even deeper texturized, personalized, or unique look. Patterns and designs are only limited by your imagination. 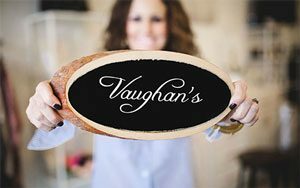 The process has been extremely popular with souvenir and gift stores, licensing opportunities, college and other name-drop sellers, and retailers looking for trendy patterns or a new creative project. Wild Mountain Soaps sells handmade soaps and lotions, and over a dozen different kinds of all natural body products. Their newest eye-catching products are their jelly and jiggler soaps. The soaps have a jelly or wiggly consistency that holds together in the bath or shower and is placed back into its container when not in use. The jellies and jigglers are fun for kids and a festive novelty item for adults. Seasonal scents and designs such as the Melted Snowman make great gifts and are certainly a one-of-a-kind item. Like all their soaps, the jellies are completely handmade. For wholesale ordering, contact info@wildmountainsoaps.com. This souvenir and gift-store favorite company, veteran-owned and family run, presents a new lemongrass essential oil lotion. Made with pure therapeutic grade essential oil, the lemongrass lotion has a sweet and mild lemon natural fragrance. The lotion is completely natural. Like all of Bates Family Farm products, the lotion is made right on their farm with fresh raw goat’s milk. Goat milk creates an ideal lotion because it’s full of fatty acids that have a similar pH level to human skin. Skin absorbs the lotion easily without a greasy film or irritation. Goat milk is also full of vitamin A, lactic acid, and selenium for long-lasting hydration. Bates Family Farm has also released new labels with UPC codes, just in time for the holidays. This all-natural stain remover spray is cleverly packaged to resemble a wine bottle, but don’t let the novelty fool you. The stain remover packs a powerful punch. A 100% biodegradable formula means no chlorine, peroxide, or phosphates, and is also pH neutral. The formula works best on fresh stains and is created to combat tough substances such as red wine, berries, beets, pomegranates, grass, and blood, on a cellular level. The potent formula makes this stain remover a party and household necessity. The fun packaging makes it a great option for retailers selling any type of party or novelty products.